As soon as Trump announced he was abandoning the Paris climate agreement, mayors and governors started stepping up. Trump may be out, but America isn’t, they say. This story was updated on June 6 with the latest numbers from the coalition. President Donald Trump may be yanking the United States from the Paris climate agreement, but states, cities and businesses are filling the vacuum by making their own commitments to reduce greenhouse gas emissions—and the numbers are mounting. On Monday, more than 1,000 companies and institutions, including more than a dozen Fortune 500 businesses, signed onto a statement—”We Are Still In“—saying they’re committed to meeting the Paris targets. The statement calls Trump’s decision “a grave mistake that endangers the American public and hurts America’s economic security and diplomatic reputation.” By Tuesday, the coalition’s numbers had climbed past 1,400. A dozen states that together represent the world’s third-largest economy and more than 200 cities had also committed to the Paris accord through various coalitions. In the wake of Trump’s decision to leave the Paris climate agreement, the world’s biggest economies denounced the move and insisted they would remain in the pact. While the president claimed he would contemplate a renegotiation of a deal that “puts America first,” the UN and several U.S. allies said renegotation isn’t in the cards. Many Americans are not wavering, either. Immediately after the announcement, a loud and adamant chorus—with a diverse array of members, from the CEO of Disney to the state of Delaware—began announcing or reaffirming their own emissions-related and clean energy goals. Like the Paris accord itself, these pledges are mostly non-binding. It’s also unclear whether these commitments can compensate for the absence of strong action at a national level. But climate experts say these efforts could keep some momentum going, even as Trump attempts to remove the U.S. from the deal. 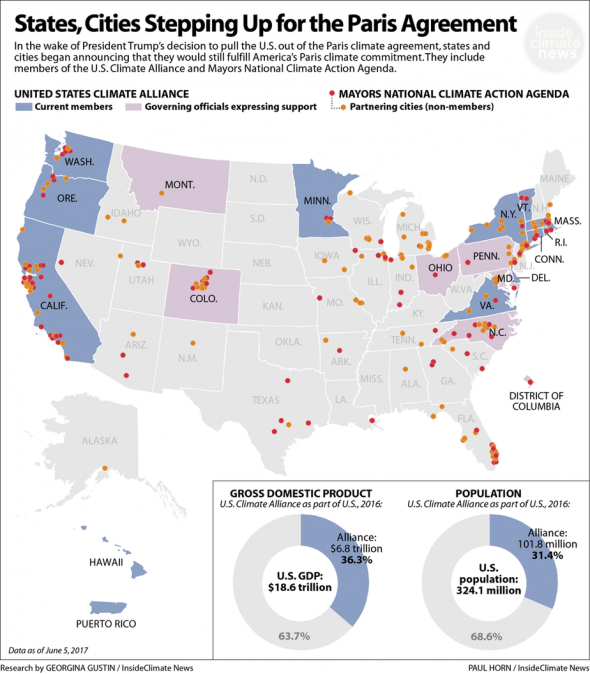 A Sierra Club analysis, released in March, determined that the U.S. could meet 60 percent of its Paris commitment through efforts by cities, states and business. Trump and members of his administration have said they favor shifting power to the states, particularly when it comes to environmental protections. This may not be what they had in mind, though. Following Trump’s announcement last week, three states—California, New York and Washington—launched the United States Climate Alliance. By mid-day Monday, the total number of governors in the alliance had swelled to 13, including Puerto Rico’s, and more are likely to join in the coming days. Two of the states in the alliance—Massachusetts and Vermont—are headed by Republican governors. “As the federal government turns its back on the environment, New York and states across the country are picking up the mantle of climate leadership and showing the world it’s possible to address climate change while also creating good-paying careers,” New York Governor Andrew M. Cuomo said in a statement Monday. “I was elected to represent the citizens of Pittsburgh, not Paris,” Trump said Thursday, in an attempted nod to Rust Belt voters who helped put him into office. Former New York Mayor Michael Bloomberg on Thursday announced what he called a “parallel” pledge to meeting the Paris goals — one that would be led by cities, states and business, rather than the federal government. “Americans are not walking away from the Paris climate agreement,” Bloomberg said in a statement. “Just the opposite.” Bloomberg Philanthropies is also committing up to $15 million to the UN’s climate secretariat—the amount it stands to lose because of Trump’s decisions. Bloomberg told The New York Times that the group would submit its own pledge to the United Nations. Christiana Figueres, the former executive secretary for the UN’s Framework Convention on Climate Change told the Times there’s currently no mechanism in place for that to occur. Firger said the primary role for the coalition, in the near-term, is to determine how much of an impact it can make. Among those committed to Bloomberg’s effort are 120 universities, whose presidents signed on to an early version of the “We Are Still In” pledge on Friday. Before Trump announced the withdrawal from the Paris agreement, more than 1,100 business and 280 institutional investors had signed on to a letter asking him to remain in the agreement. At least two dozen Fortune 500 companies, with more than $1.2 trillion in assets, were among those who signed on. Signatures came from a spectrum of business leaders, including the heads of Ford, Mars, Goldman Sachs and GE. After Trump’s announcement last week, Elon Musk of Tesla and Bob Iger of Disney announced they would leave the president’s business advisory council in protest. On Monday, the business world continued to sound its protest. More than 1,000 companies, investors, academic institutions added their names to the growing Paris commitment. Now it’s up to them to follow through.